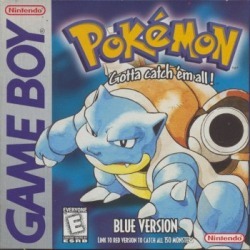 Pokemon Blue Secrets Infinite Steps in Safari Zone This trick is very simple. Find a patch of grass in there. Stand in it and just tap the directional pad lightly just so you would turn without walking. You should encounter a pokemon and catch it if you would like. Get a diploma To get the diploma catch all 150 Pokemon and go and see Professor Oak in his lab. He will then give you the diploma. Moonstone evolution without moonstones If you have a pokémon that needs a moonstone to evolve, you can cause it to evolve though normal battling. First make sure that the pokémon needing the moonstone to evolve is in the lead position before going into a battle. Once the battle has started, switch that pokémon with another that knows the move "Mimic". Have this pokémon continually use Mimic to defeat your opponent. If the shared experience gained from battle is enough to level up your moonstone needing pokémon, it should evolve as if a moonstone was just used on it. Pokemon Blue Glitches Duplicate Pokemon You need a link cable, 2 pokemon games, and 2 gameboys for this trick. On 1 gameboy, have a strong pokemon that you both want. On the other, have a weak pokemon that your willing to give up for the other one. Enter Trade mode and trade pokemon. 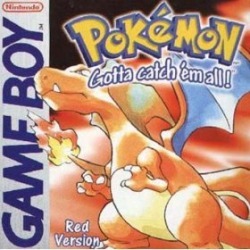 On gameboy 1 (the one with the good pokemon), turn off the gameboy right before it says ''Trade Complete!''. The 2nd GB should say ''Trade Complete!'' on it. If done correctly, the bad pokemon on GB 2 should be deleted and replaced with the good pokemon. The good pokemon on GB 1 should still be there. Duplicate items To get WELL 99 of an item, put the item you want duplicated in the sixth item slot. Make sure you have the Fly HM, then Fly to Viridian City. Talk to the old man that stopped you in the begining of the game( kind of to the north) When he asks if you are in a hurry, say no and watch him catch a weedle. Pokemon Red Secrets Cut's secondary effect You may already know that Cut cuts down small trees to clear a path for yourself. If you use Cut while standing in a patch of grass, it will cut the grass so you won't encounter Pokemon in that spot. The grass is reset if you leave the area. Get a diploma To get the diploma catch 150 Pokemon and go and see the designer in the mansion in Celedon City. He will then give you the diploma. Have one Pokemon game with a pokemon that you both want (generally a starting pokemon, a legendary, or Mewtwo). Have the other game have a pokemon that you wouldn't miss, as it will be deleted forever (Example: Level 4 Ratatta). Once you both have your pokemon, enter a trade. Now, trade the bad pokemon for the good pokemon, and at the end of the trade, right after the screen flashes &quot;Waiting...&quot; but before it flashes &quot;Trade Completed,&quot; the person who originally owned the good pokemon should turn off their Gameboy or pull out the link cable (turning off the power is the preferred method, but should work). The person who originally had the bad Pokemon should have the message &quot;Trade Completed&quot; on their screen. If done correctly, you will both now have the good pokemon. The person who originally had it turned off their Gameboy before it could save, so his gamepak doesn't know the trade ever took place. The second person's Gameboy remembers the trade, and has the new Pokemon. This can only be done on Red Version of Pokemon. Do the steps described for infinite items. When you encounter the bar shaped thing (also refered to as Missing No. ), use a master ball (if you have infinite) and capture the Missing No.. WARNING: Only do this is if Missing No. is at level 80. Level 0 Missing No. WILL lock your game up. It will say that you captured #### n' #### as it's name will look in the screen. For some reason it will continue to attack. Just run. If you can't, keep trying until you do. Get Missing No. into your party and give it a Rare Candy. It will move to Level 81 and say that it is evolving. I t evolves into... TAA-DAA!! Kangaskhan! This is no ordinary Kangaskhan. It has three attacks; Water Gun, Water Gun (again), and Sky Attack. Safari Zone Pokemon Caught easy 1) Go to the Safari Zone and wander around until you run into one of the more rare and hard to catch pokemon. 2) Run away from it and immediately use dig, teleport, escape rope, fly, or anything else that will take you immediately out of the Safari Zone. 3) Surf down to the Seafoam Islands from Fushia City (Use repel if you got it to avoid encounters) 4) Surf up and down the East Coast of Seafoam. (Make sure you stay on the very edge so you are half on land half in the water) 5) Your first pokemon encounter should be the pokemon you last saw in the Safari Zone. I highly recommend using the infinite item glitch to get loads of master balls first so you don't risk killing your quarry.... or worse being killed by it. Very nice little trick, that will save some serious annoyance when trying to catch Pokemon like Tauros and Ryhorn who just don't want to seem to want to stay in the safari balls. Get about 150 of your sixth item (Great for master ball and rare candy) First talk to the guy in Viridian City that tells you how to catch pokemon. Tell him you aren't in a hurry, and when he's done fly to Cinibar Island and use surf to surf on the half water half land shore area. When you run into Missingno run away. Your six item will have a random thing instead of a #. It is now duplicated. You can this glitch as many times as you want. *! *You can also use this trick to catch rarer pokemon like Starmie or Taurus and sometimes one of the 1st three (the wil usually have insanely high levels so I recomend a master ball, after all you should have a lot of them!) An Extra Bike Simply attempt to put your bike into the computer at any Pokemon Center. Instead of going in, you will have one in your bag and one in your computer as well. Skip Marowak fight The top floor of the Pokemon tower is blocked by the ghost of a Marowak, which can't be identified and defeated until you get the Silph Scope in Team Rocket's Hideout. Or apparently not, because if you use a Poke Doll item in this fight, with the Silph Scope or not, you'll escape the battle and Marowak will be defeated! With this trick, you can get to the top floor and save Mr. Fuji and get the Poke Flute without ever going into Team Rocket's hideout. Re-board the S.S. Anne To Re-board the S.S. Anne, have a Pokemon that knows Surf with you. Go to the guy who says "the ship set sail". You'll be diagnall from him. now go in front of him and save. Turn your GB off and back on. Use your SURF Pokemon and hold DOWN. You'll be SURFing on the guy. Press DOWN the after SURFing, and you should be in the ship. Pokemon Yellow Unlockables Get the Diploma Complete your Pokedex (Mew is optional) and visit the game designer in the Celadon Mansion. He will give you a diploma as a reward. 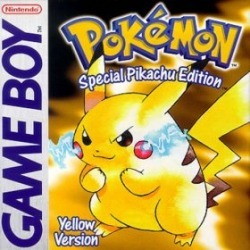 Pokemon Yellow Secrets Pikachu's Beach Mini-Game Use the Pikachu from your Pokemon Yellow in every match in the Tournament mode of Pokemon Stadium. Pikachu should learn Surf. Now go south of Fuschia City and into the house at the beach. Talk to the man inside. Make sure Pikachu is in your party. You should be able to play a mini-game. Get through grassy areas without a single random encounter. Once you've obtained the HM Cut you can use it to teach some of your pokemon the attack of the same name. When saving and loading or leaving and reentering the area you used cut in, the grass will have returned. 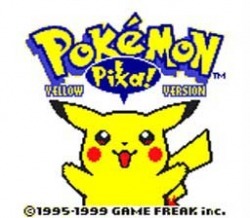 Pokemon Yellow Glitches Have Pikachu instantly like you! When you first start your game, you will have 1 potion in your pc that's in your room. Get it out. Continue playing the game untill you get Pikachu but haven't battled Gary's Eevee yet. Use the potion on Pikachu 5 times (even though it won't have any effect). Fight Gary and WIN. After the battle, when your Pikachu comes out of the Pokeball. He will like you.